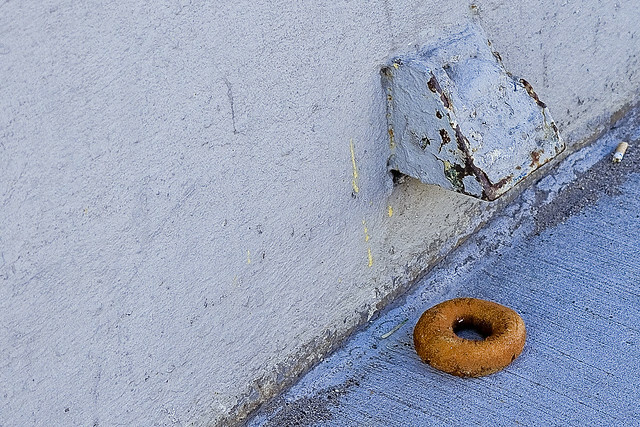 A baited trap, in LIC. 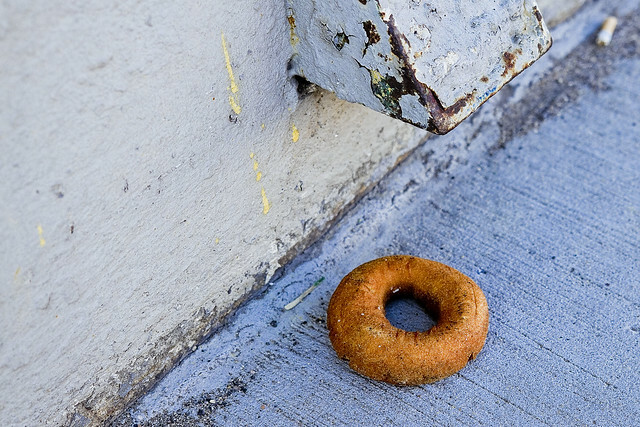 Everyone knows about the particular predilection that the Gendarme has for those toroids of fried and sweetened dough which are commonly called Donuts, and it is simply “messed up” that someone seems to using one as bait. Should a hungry constable happen along and happily reach for this confection, what sort of snare might be triggered? Is this a cop trap of some kind? What’s hidden inside that duct or pipe? The funny thing about the cop/donut myth is that it really isn’t true. Most of the police officers I’ve met over the years were actually in pretty good shape, and the ones who weren’t in wholesome condition owed it to a love of the brewer’s art rather than that of the baker’s. Still one wonders how many innocent but hungry servants of the realm hereabouts have been ensnared on this LIC block, adjoining Skillman Avenue? Commonly held, the mythology about American Police and their love for donuts is reasonably predicated upon the frequent observation of unit cars and uniformed personnel, by the citizenry at large, congregating at locations commonly called “Donut Shops.” Simply answered, even if your job is to drive around a neighborhood for eight hours at a pop, you still need to pee and or buy coffee periodically – an endless cycle in itself – and sharing a common location for such activity allows units to compare notes on the days events. Donut shops are open late, as are the Police. 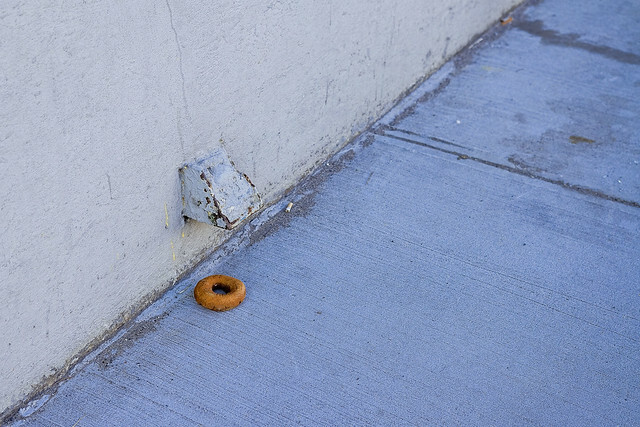 It’s messed up that someone is setting out donut baited snares though, and provides for a worrisome development within this, our Newtown Pentacle. Tugboat! There’s a tugboat coming! 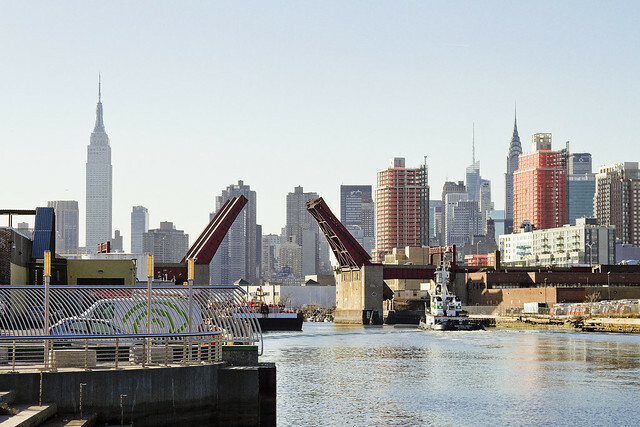 Bemoaning a life lived poorly with a ribald song of lament, your humble narrator found himself crossing the fabulous Pulaski Bridge over Newtown Creek recently, whereupon the appearance of maritime traffic entering the waterway sent a bolt of joy up my crumbling spine. Even feckless quislings can catch a break sometimes, thought I. One was forced to scuttle at double pace across the bridge, in order to not allow the opening of its double bascule mechanisms to visually isolate me from the passing Tugboat. Occlusion is frustrating, extremely so. 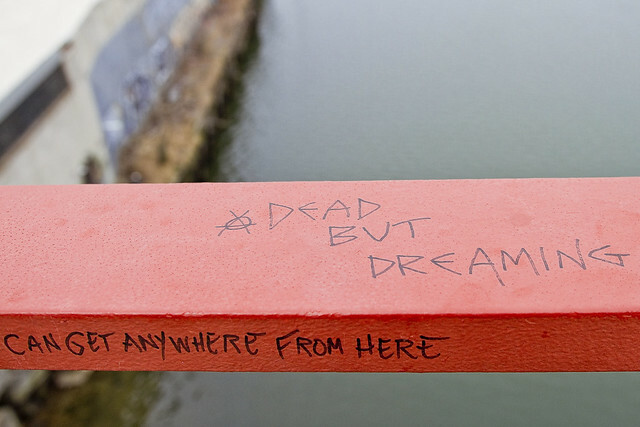 Accordingly, haste was made for the Greenpoint or southern bank of the Newtown Creek. The NYC DOT, who operate this bridge, will unfortunately not allow me to get close enough to shoot properly, so several lenses were utilized. Swapping out lenses is not something I like to do in a spot like the Pulaski Bridge, where the particulate dust and soot circulating on the air is particularly dense, for fear of allowing contaminants to settle inside the camera itself. Unfortunately, I was quite far from the Tug, and less than ecstatic about the images produced by my “longest” lens. The next upgrade to my photo bag is going to be a good lens with lots of reach, an expensive proposition. 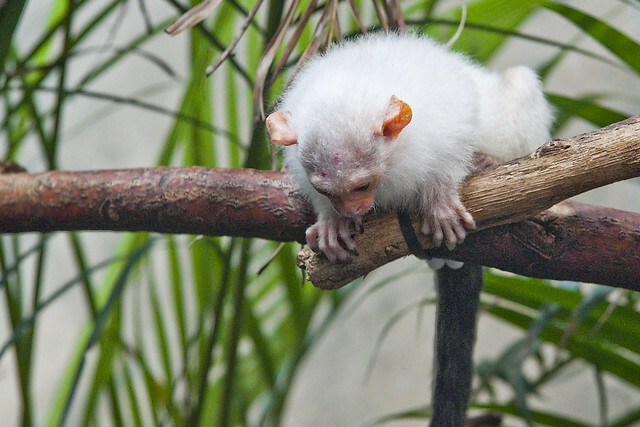 Of course, the simple answer to not having a lens with sufficient magnification or optimal resolution is to simply get closer to your subject. Hunting Creek pulled away, towing a fuel barge to some destination eastwards, but I knew that eventually… she had to come back. Hunting down anything along Newtown Creek is my speciality, as well as finding the best spot to view it from, so your humble narrator was waiting with a medium reach but high quality lens attached to my camera when Hunting Creek made its way back towards the East River and the greater harbor beyond. What? 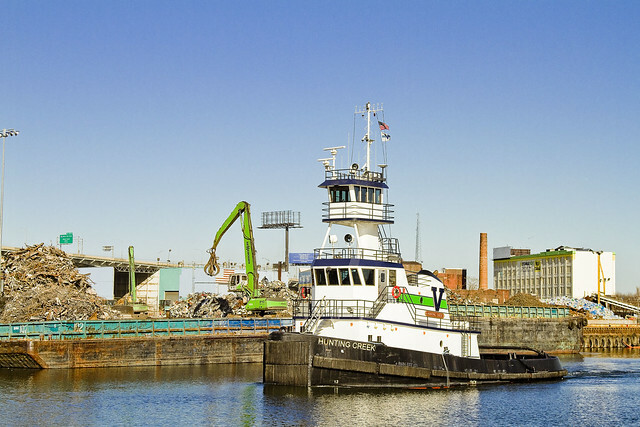 I like photographing tugboats. The warning horns that Pulaski was opening sounded and the tug maneuvered into its course. Tower Town in LIC is really coming along, incidentally, and views like the one following will soon be a happy memory. They’ve already blocked out the Chrysler Building. 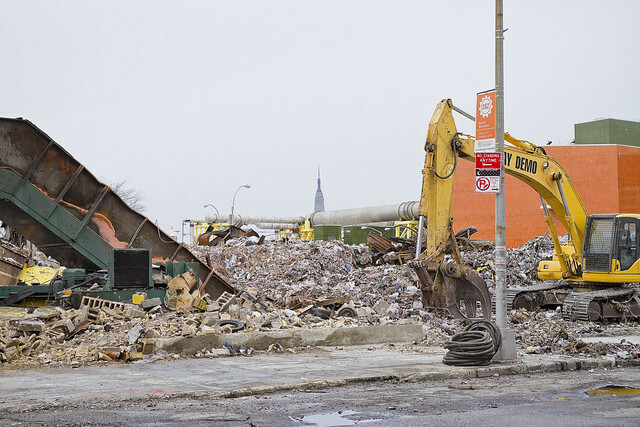 When Greenpoint Landing gets going, we’ll lose Empire State as well. That’s what I saw on Newtown Creek one day last week, when one set out to cross a bridge and walk about in the radiance of the burning thermonuclear eye of god itself. 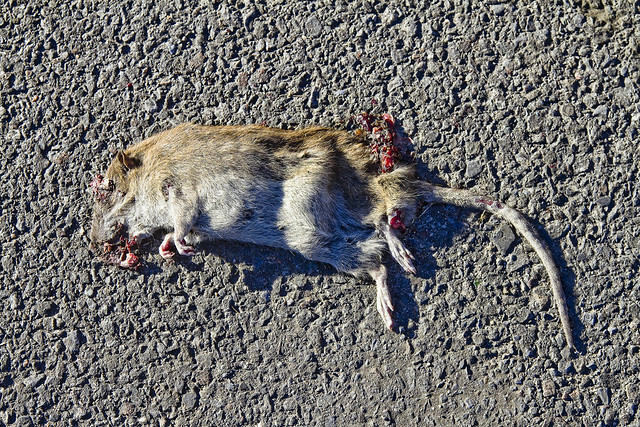 When I was walking home – through Greenpoint – I almost stepped on this flat rat, which kind of ruined my day. Curdling horror notwithstanding, the sight shocked me back into a looming sense of depression and reinstated the familiarly manic state which I was hoping to alleviate via the perambulation across the Pulaski Bridge and the banks of fabled Newtown Creek. I guess it’s true what they say – “A Feckless Quisling just can’t catch a break these days.” People say that, right? 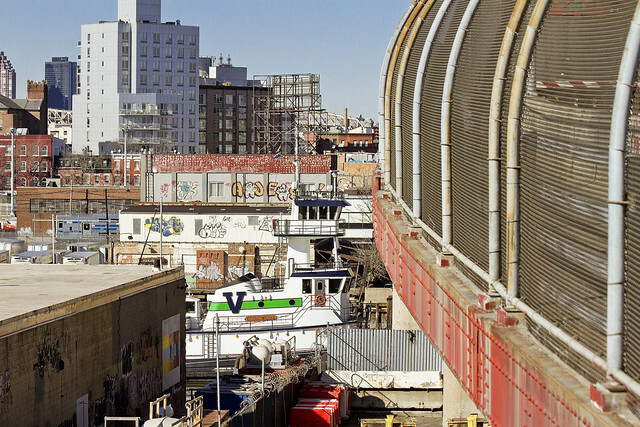 Up Next: 13 Steps across Dutch Kills, at Newtown Creek with Atlas Obscura, Saturday, April 5th – click here for more information and ticketing. The 2014 Walking Tours begin. 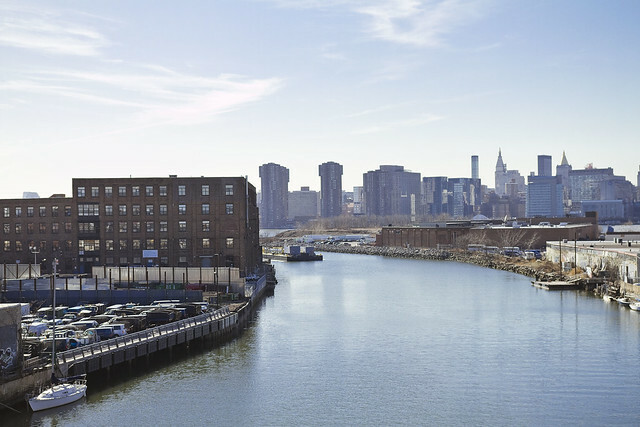 Join Newtown Creek Alliance Historian Mitch Waxman and Atlas Obscura for an intense exploration of Newtown Creek’s Dutch Kills tributary – found less than one mile from the East River. 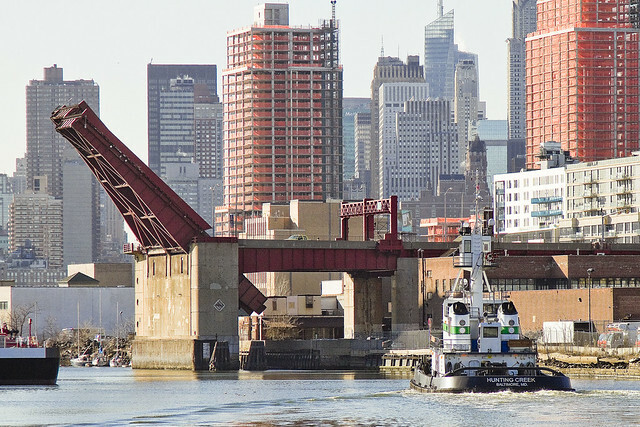 Dutch Kills is home to four movable (and one fixed span) bridges, including one of only two retractile bridges remaining in New York City. 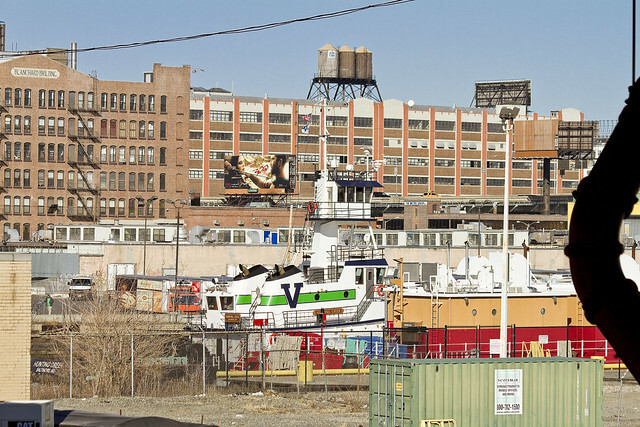 Dutch Kills is considered to be the central artery of industrial Long Island City and is ringed with enormous factory buildings, titan rail yards – it’s where the industrial revolution actually happened. 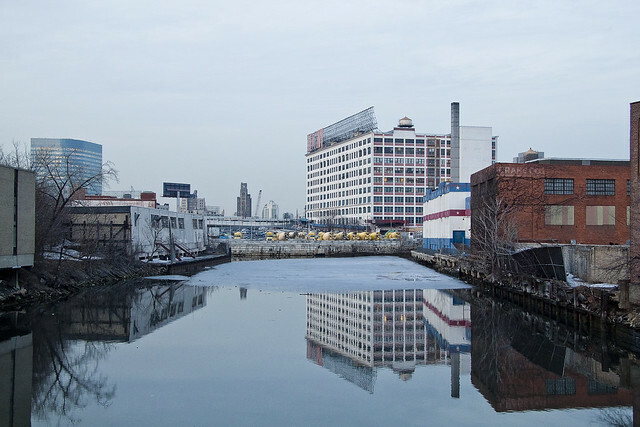 Bring your camera, as the tour will be revealing an incredible landscape along this section of the troubled Newtown Creek Watershed. 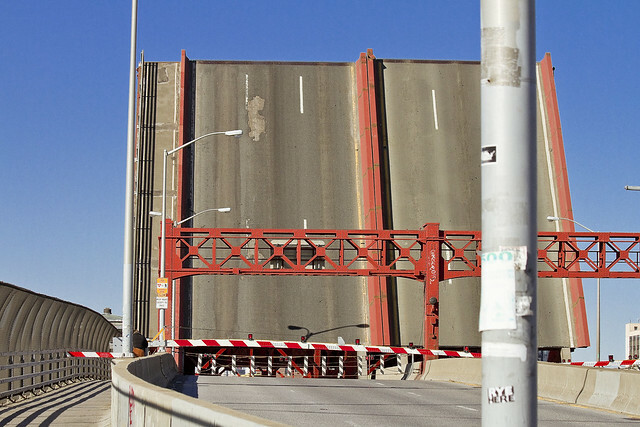 Be prepared: We’ll be encountering broken pavement, sometimes heavy truck traffic, and moving through a virtual urban desert as we cross the currently undefended border of Brooklyn and Queens. Dress and pack appropriately for hiking, closed toe shoes are highly recommended. Bathroom opportunities will be found only at the start of the walk, which will be around three hours long and cover approximately three miles of ground. Meetup – At the Albert E. Short Triangle park found at the corner of Jackson Avenue and 23rd Street in Long Island City, Queens. This is the Court Square MTA station, and served by the 7, G, and M lines. Additionally, the Q39 and B62 buses have nearby stops. 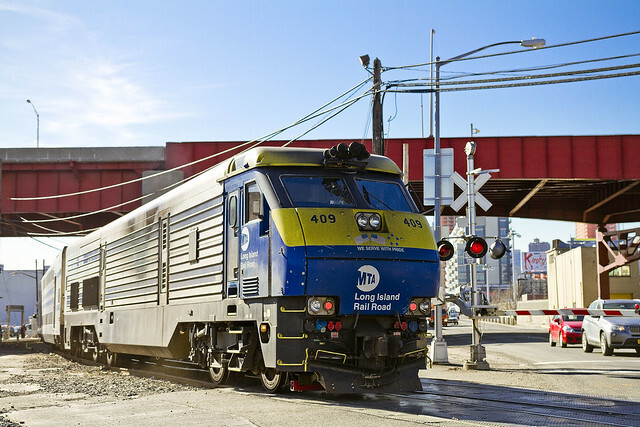 Check MTA.info as ongoing construction at Queens Plaza often causes delays and interruptions. Catching up with the Newtown Pentacle. This long winter has been especially difficult for one such as myself, who possesses no reserve of warmth. Accordingly, hermitage is enacted. Hair, beard, and nails are allowed to seek their natural length while an induced stupor was enjoyed by the brain. Now that the burning thermonuclear eye of god itself has once more attained an efficacious position in the sky, all of the dead cellular material external to the skinvelope has been trimmed back and an understimulated brain called to action once more. The long marches across the concrete devastations have resumed. 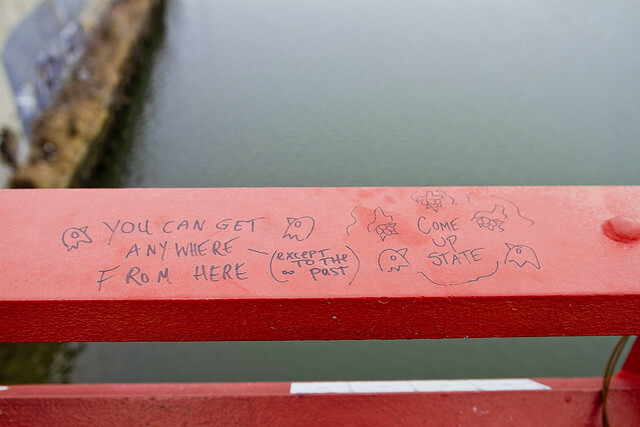 Last Sunday, whilst crossing the Pulaski Bridge to visit Greenpoint via Long Island City, these graffitos were spotted. Displaying an unusually literate and somewhat scientifically accurate credo, my attentions were caught. It wasn’t this screed which stopped me in my tracks, instead it was the one in the penultimate photograph adorning this post. Those cool firemen from Williamsburg, spotted in Blissville, Queens. 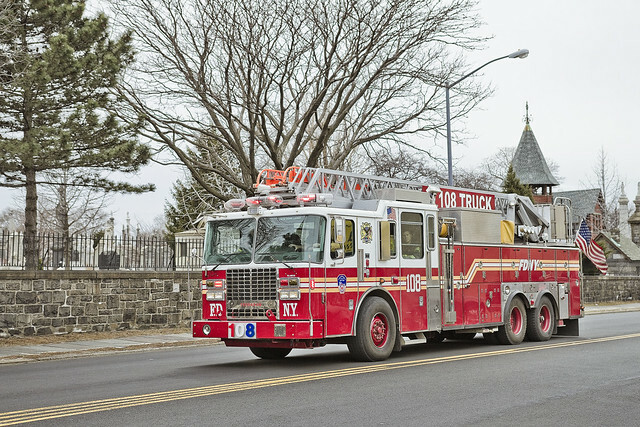 A humble narrator does like hisself a fire truck – and having never surrendered the childhood desire to run along the sidewalk screaming “firemen, firemen” when a fire truck goes by – when a Brooklyn based unit comes screaming out of a fire house in Blissville – it catches my eye. For some reason, 108 came out of the Ladder 128 house on Greenpoint Avenue – obviously on a call. 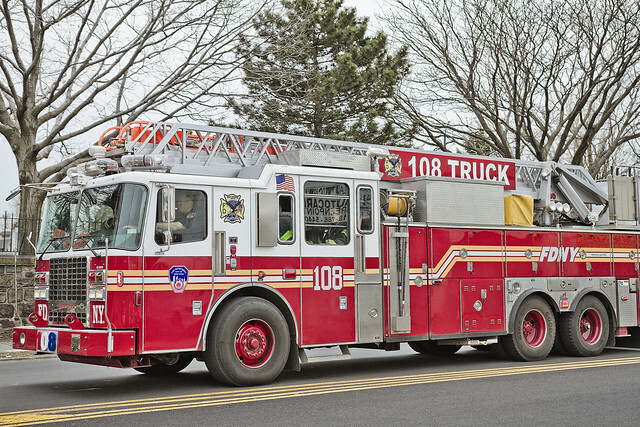 My confusion is based on the fact that one normally expects Ladder 108 to deploy via Union Avenue in Brooklyn. History: Ladder 108 Ladder Co. 108, now quartered at 187 Union Ave., Williamsburg, Brooklyn, began life as Hook & Ladder Co. 8 in the old City of Brooklyn Fire Department at 112 Siegel Street near Graham Avenue on November 30, 1887. During this time, to be distinctive, the Brooklyn Fire Department used two-tone green on their apparatus, while F.D.N.Y. apparatus was red. Green continued to be used until consolidation of the five bouroughs in 1898. On January 1, 1898, Ladder Company became part of the Fire Department of the City of New York. It was renumbered as Ladder Company 58 on October 1, 1899. It was not until January 1, 1913, that Ladder 58 was renumbered as Ladder Company 108. In the 110 years of Ladder 108’s existence, two members lost their lives in the line of duty. A fire in Queens on March 2, 1905, took the life of Lt. George McGeary and 27 years later on May 2, 1932, Firefighter Joseph LaGrange was killed when Ladder 108 and Engine 213 collided responding to a false alarm and Firefighter LaGrange was thrown to the street. Ladder 108’s tenure at 112 Siegel Street lasted 84 years and on August 9, 1971, 108 truck moved to a new firehouse at 187 Union Avenue and is still quartered there. Of course, the ways and means and mores common to those “firemen, firemen” are many and complex, so no profit can be realized by analyzing their methods. Luckily, one had the opportunity to crack out a few shots of the hurtling ladder truck as it sped along past the walls of Calvary. 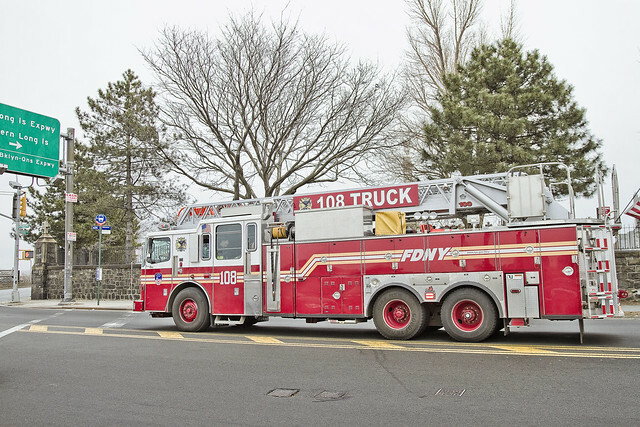 FDNY Ladder Companies (also known as Truck Companies) are tasked with search and rescue, forcible entry, and ventilation at the scene of a fire. A Ladder Company can operate three types of Ladder Trucks: an Aerial Ladder Truck, equipped with a 100′ aerial ladder mounted at the rear of the apparatus; a Tower Ladder Truck, equipped with either a 75′ or 95′ telescoping boom and bucket mounted in the center of the apparatus; a Tractor Drawn Aerial Ladder Truck, or Tiller/Tractor Trailer, equipped with a 100′ aerial ladder. A Ladder Company carries various forcible entry, ventilation, and rescue tools to deal with an assortment of fires and emergencies, including motor vehicle accidents. Can’t help but wonder where Ladder 128 was, maybe they loaded the truck up and drove to Florida for a vacation or something. I like the idea of a whole crew just taking off for a few days, pulling into 711 parking lots along I-95 for toilet breaks and microwave burritos. The random appearance of NYC vehicles in other parts of the country – a taxi or a police car for instance – would be positively dada. Police officers inside the 90th Precinct were in just the right spot for such an emergency — someone from the station house simply ran next door to report the fire to Battalion 35 Engine 216 and Ladder 108. The firehouse shares a city building on a Williamsburg block with the NYPD. What the end of the world will look like, as observed in Greenpoint USA. 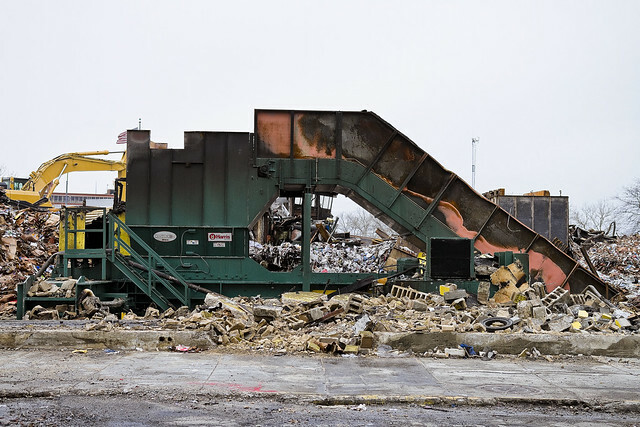 Manhattan’s recyclable paper and plastic went up in flames in Greenpoint the other night, when a blaze began at the Rapid Processing Center on Humboldt St. and Greenpoint Ave. at around 7 p.m. on March 18th. 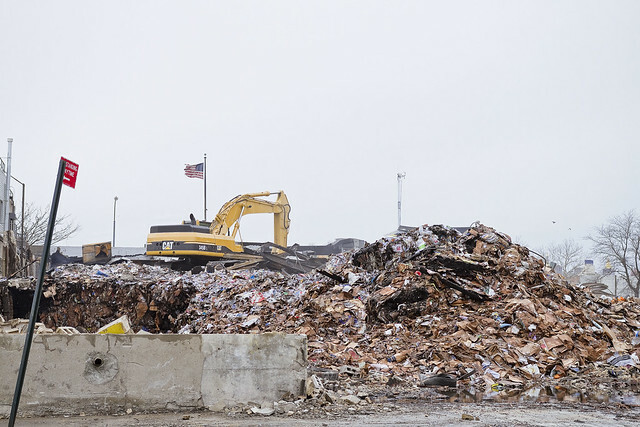 The operation was in the Waste Transfer Station Recycling business, acting as a depot for the unloading of the DSNY’s white packer trucks which perform curbside pickup of paper and plastic materials. In the end, it took 200 firefighters and all of their arts to fight this four alarm fire. 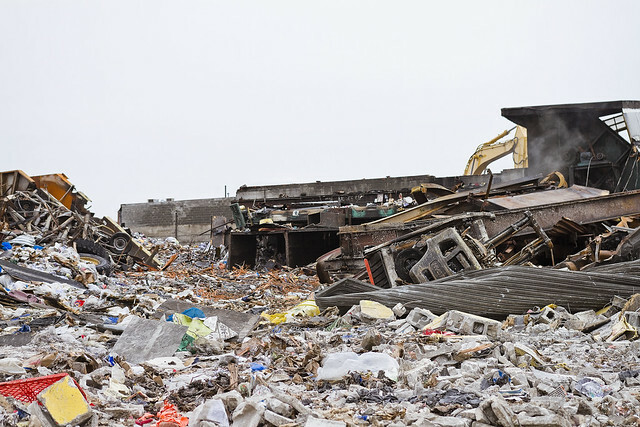 Almost as soon as it started, social media sites like Facebook began to light up as well with comments and queries offered by community members about the fire and the possible hazards of being exposed to its smoke and effluents. 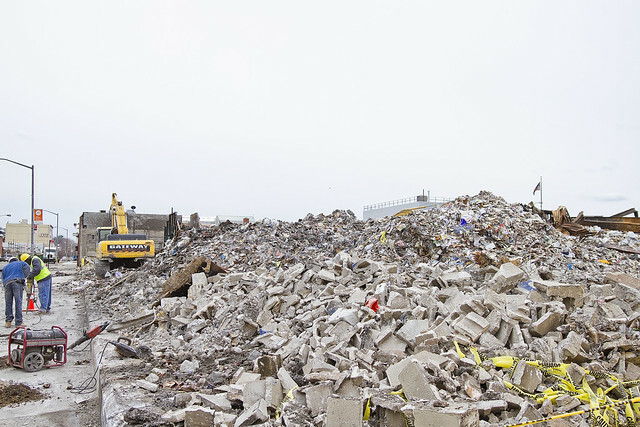 It seems that the torrents of water used to combat the blaze also flooded the streets, and news reports described a lake of water on Greenpoint Avenue, which carried garbage off the site and allowed it to move around with the wind as flotsam. 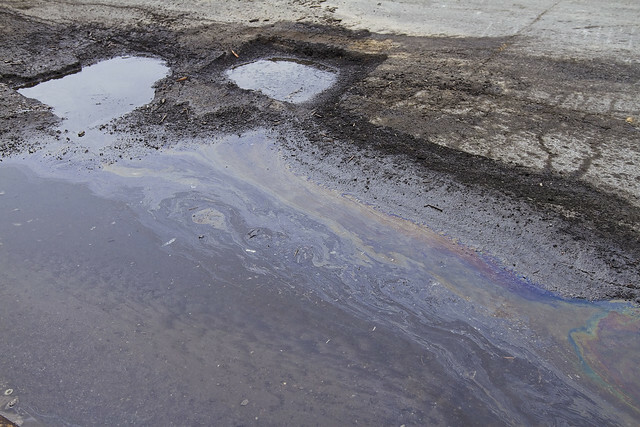 As you can see in the shot above, puddles of unusual size persist, and carry a sheen of something on their surface. These shots were captured yesterday, March 23rd, and the mound of material was still smoldering. The structure is a total loss, obviously, and I did observe air quality monitoring equipment at work. Directly following the fire, FDNY announced that there was nothing, air quality wise, for the community to fret about. Of course, there was reportedly NO air quality monitoring going on during the fire when a plume of (probably) dioxin laced smoke was infiltrating into the neighborhood. 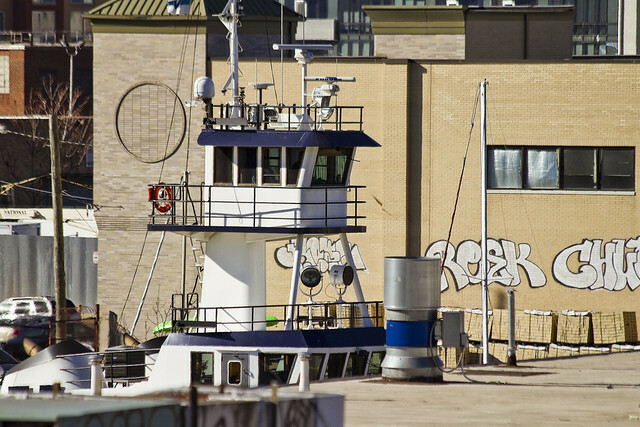 There was talk following the flooding of Hurricane Sandy about prepositioning environmental sampling kits around Greenpoint, so that actual “time of event” samples could be captured, but that seems to have been forgotten. Green Infrastructure, instead, is the buzzword of the present day. During the fire your humble narrator was safe and sound and upwind in Astoria, but a point was made of interjecting myself into their lively debate to adjure the Greenpointers to call 311 and complain of the smoke, as this would have compelled DEP to set up air monitors DURING the event. No one listened, and no monitors were set up, so everything is fine and nobody was exposed to anything bad. New York City would not acknowledge the presence of an elephant in the City Council chamber room unless a statistically relevant number of 311 calls were received about it. The whole Time Warner Cable situation has me down. 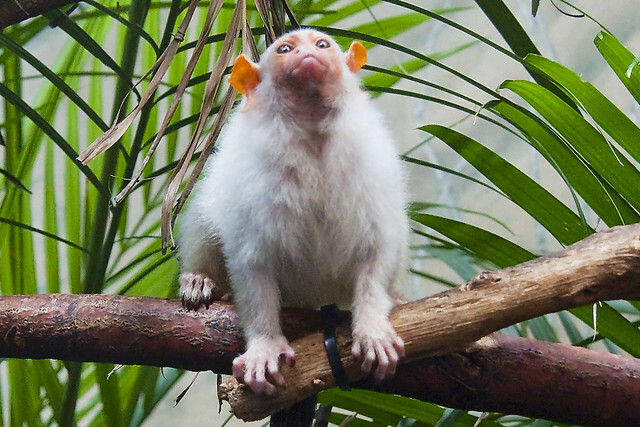 Here’s the story – which is being said out loud just for the sake of sanity – back in January, the Internet service started cutting out sometime between 10 p.m. and 12:30 A.M., eventually re asserting itself after a random interval. The first week or so, I chalked it up to TWC upgrading something upstream from my connection, or performing some sort of maintenance. After the 2nd week of interruption, I called in and reported the issue. As it continued into February, I began to time my calls so that the TWC rep could remotely “ping” my modem and visualize what was happening with their network diagnostic tools. 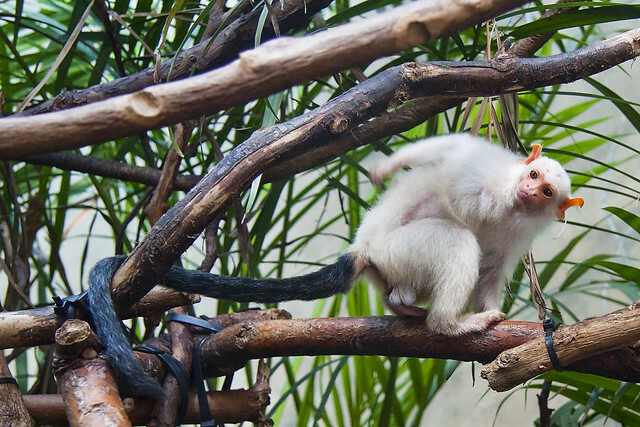 The network “pings” revealed that something was causing “48% packet loss” which is a technical term that refers to a sort of interference wherein two connected devices (server and modem) are having trouble communicating. It’s a bit more complicated than that, of course, but basically the modem is unable to supply a network connection which will allow my gizmos to connect to the web. TWC decided this was puzzling, and after forcing me to do their whole “unplug the modem, restart the computer” nonsense, agreed to send out a technician. Two missed appointments later, somebody showed up and replaced the modem. The problem persisted despite this. Part of the reason I hate this organization as much as I do, and I am not alone in this ennui, is that in order to solve the problems which manifest from their end the customer has to manage the situation. From my first call, I asserted that the problem was not within my walls, rather it was an issue emanating from outside of them. They sent out a “Tier 3″ guy who was afraid of the dog, who confirmed my assertion and ordered a lineman crew out. The lineman told me “yeah, the unit on the utility pole is working fine, as is your modem. 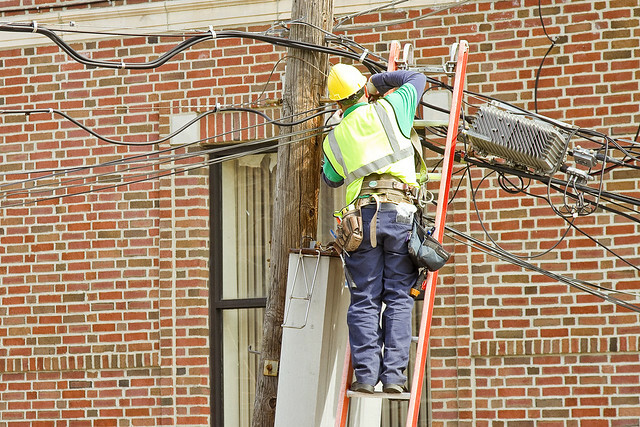 The issue is actually with the wires running between the pole and your house, which show all the signs of water infiltration.” He arranged for the wires to be replaced. Yesterday, when the “replace” guy showed up, he neglected to bring a ladder, and TWC somehow intended for one guy to replace wires hanging 40 feet over the pavement that stretch 100 feet across a busy Astoria street all by himself. Time Warner Cable Inc. (TWC), formerly Warner Cable Communications and sometimes colloquially referred to as simply Time Warner, is an American cable telecommunications company that operates in 29 states and has 31 operating divisions. It is the second largest cable company in the U.S. behind only Comcast, which has agreed to acquire TWC pending regulatory approval. Its corporate headquarters are located in the Time Warner Center in Midtown Manhattan, New York City.